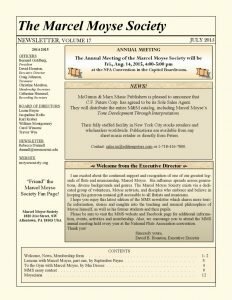 The Marcel Moyse Society has a tradition of publishing in-depth articles every year or so. We are looking for a new editor. The MMS will help solicit articles, we just need a skilled editor to put in proper format. It is a volunteer position though you will be interacting with musicians from all over the world and contributing to the teaching legacy of Marcel Moyse. View and read all of our newsletters since the beginning of the society.